Today on my blog I'm writing about what I thought about these natural and cruelty-free Forever samples that Hannah from hannahbridelifestyle kindly sent over to me to try out and to review. This moisturising lotion contains nourishing aloe, jojoba oil, collagen and elastin. It's a moisturiser which can be used all over your body. It's easy to absorb formula makes it a great base for make up. After trying this I thought it is a great moisturiser to pop on at night or to use as a primer under your makeup as it mattifies your skin well. It smells really nice and fresh and it applies smoothly. This tooth gel is a gentle, non-fluoride formula. It contains aloe vera and bee propolis to help protect teeth and gums whilst fighting plaque. It contains no bleaching agents and it's suitable for children and adults. It is a green coloured tooth gel and should be used after meals. But I have used it as normal toothpaste and it works fine. My teeth felt lovely and clean after using this. A little goes a long way as it foams up really well and it has a nice taste which isn't too overpowering which I personally prefer. This creme is a rich and creamy blend of aloe vera, bee propolis and chamomile. Hannah who sent me the samples over said that it was a great to be used as a hand cream, so that's what I've been using it for. It is very thick but it dries fast, which is great! It can also help to soothe any irritation. It does smell quite clinical but if that doesn't bother you then I'd definitely say give this a go because it's a great hand cream. The Aloe Blossom Herbal Tea contains a natural blend of leaves, herbs and spices. (Cinnamon, Orange Peel, Cloves, Blackberry Leaf, Allspice, Fennel, Ginger, Cardamom, Aloe Blossoms, Gymnema Sylvestre, Chamomile) It's caffeine free and has been formulated to leave you feeling lovely and revitalized. You can also drink it hot or cold, whichever you prefer. So I tried this and I have fallen in love. It literally tastes like Christmas, if that makes sense? It's very spicy and quite strong but it's really yummy. 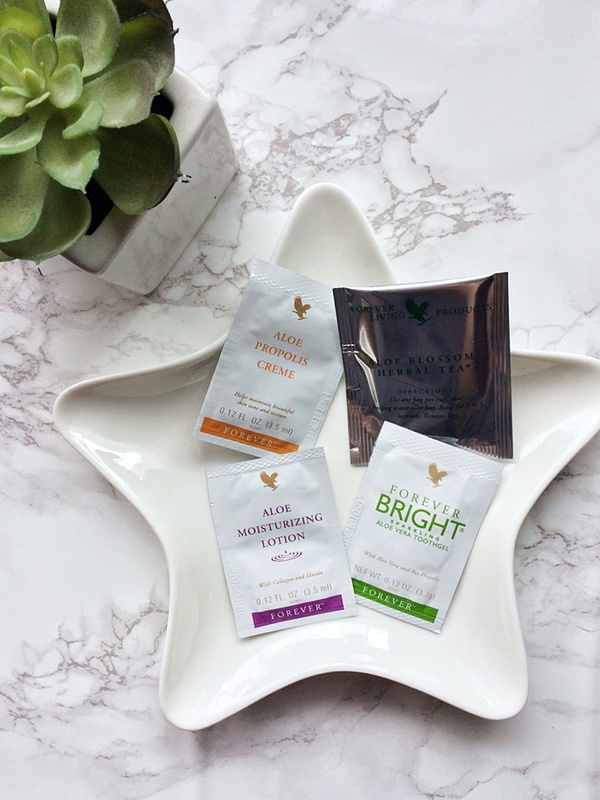 If you're thinking about buying and trying some of the Forever products yourself then you can contact Hannah on her instagram or via email hannah.bride@live.co.uk and she will get back to you. Have you tried Forever products before?